Cigarette smoke and e-cigarette vapor inhalation exposure applications often require increased degree of precision in delivering the right amount of smoke mixture in a consistent manner to the exposure modules. Oftentimes, conventional passive dilution and mixing methods to generate and deliver the right smoke mixture may not suffice. To meet the needs of those customers, whose applications require very fine control of the smoke exposure parameters, CH Technologies offers an automatic cigarette smoke and e-cigarette vapor concentration control system, the Cigarette Smoke and E-Vape Siphon. The siphon is placed between the cigarette smoking machine and the exposure module to control, with accuracy, the concentration of the cigarette smoke or e-cigarette vapor delivered for in vivo or in vitro exposure. The device is controlled by a proprietary software that runs in a LabView environment. All control parameters, including dilution air flow rates, siphoning flow rate, and real-time values of smoke or vapor concentration are recorded for QA/QC purposes. The concentrated main stream smoke or vapor coming from the smoking machine is mixed and diluted in a two-stage process with clean air and the resulting concentration is measured by a calibrated light scattering aerosol monitor. The desired concentration is set on the control software which uses the feedback from the aerosol monitor to control the delivery rate of the mixed smoke via a vacuum mass flow controller that siphons off small amounts of concentrated smoke or vapor to keep the output constant around the set point. A model variant for mixing in side stream, in addition to main stream, smoke or vapor is available. 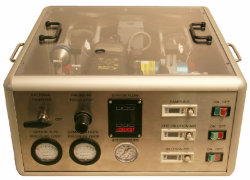 Whether controlling the concentration directly at the outlet of the siphon or at the exposure target (breathing zone or air-cell interface), the siphon offers superb capabilities for accurate control and consistent delivery of the required smoke or vapor exposure to test subjects. With few modifications, the siphon can also be used for controlling e-cigarette vapor, other aerosols, or gaseous test atmospheres.